There is only one Bear Creek Lumber. Family owned and operated, BCL has been offering its specialty lumber services to the general public since 1977. Bear Creek Lumber has a thirty year association with the finest mills in North America. We carry an inventory of top quality products administered and sold by a top notch professional staff. Bear Creek Lumber standard inventory includes hard-to-find American and Canadian softwoods and exotic hardwoods. The huge selection of grades and species kept in stock is unique. The company's freight department regularly ships these products to every corner of the country, including South Pacific and Caribbean destinations. Over the years, Bear Creek Lumber has built up a reputation for quality products, services, fairness and dependability. It has gradually added a staff of trained workers who enjoy their work, and who like to discuss with their customers their special needs. Bear Creek Lumber has been careful not to grow too quickly, preferring a low-key approach to business that keeps relationships between staff and customers friendly, while maintaining a professional business atmosphere. The company keeps in touch with its many customers through a newsletter service called Timberline. The four-page publication is available monthly and includes industry news, company promotions as well as correspondence from customers from around the U.S.
Click on any picture to be taken to that employee's page. Click here to see all our complete team. 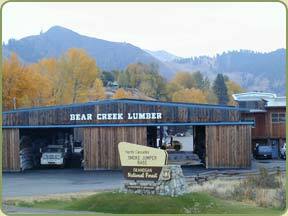 Bear Creek Lumber has one central location in a remote but scenic part of North Central Washington State. The area is best known as the premier nordic ski area of Western North America. It is also the gateway to the North Cascades National Park, a mountainous region that holds an abundance of wildlife and is the northern end of the scenic Pacific Crest Trail. The Methow Valley, as this area is known, is a vacation spot for many but a home for the employees of Bear Creek Lumber. Despite its rural location, it has the latest in computer technology and fiber-optic telecommunications equipment. Bear Creek Lumber customers have the advantage of being able to access our inventory conveniently by calling our toll-free number (800) 597-7191) to place their orders. E-Mail is also a way to place an order with us. The company can send a facsimile or PDF of that order to the customer to provide quick and easy service. Bear Creek Lumber operates out of an office and warehouse complex. The company freight department handles all shipping so BCL customers' only concern is arranging the unloading at the time of delivery. Customers are also welcome to visit the company headquarters, and receive a tour of the facilities and inventory. There is no scheduled commercial air or bus service to the Methow Valley, but those wishing to make the drive can fly into either Spokane, Wenatchee or Seattle, or fly in your own aircraft to the Smokejumper's airport next door. Click on the "+" to zoom in and see street names, or zoom out "-", and see a State map. Note: Winter road closures on Hwy 20 are not reflected in Google maps, please call for directions during the winter months. For more detailed driving instructions, contact the Bear Creek Lumber office or consult AAA.